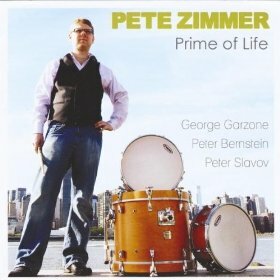 Drummer Pete Zimmer’s new album is Prime Of Life (Tippin’ Records, 2012). It features George Garzone on saxophone, Peter Bernstein on guitar and Peter Slavov on bass. In this interview, Zimmer talks about swing — what it means to him and how he approaches playing it; the primacy of sound in his selection of bandmates and in his own playing; and the differences between being a leader and a sideman. Learn more at petezimmer.com and follow him on Twitter at @PeteZimmer. NOTE:: This is Pete’s second time on the show. He was originally on episode #10 (!) way back in 2007. Listen to his first appearance.